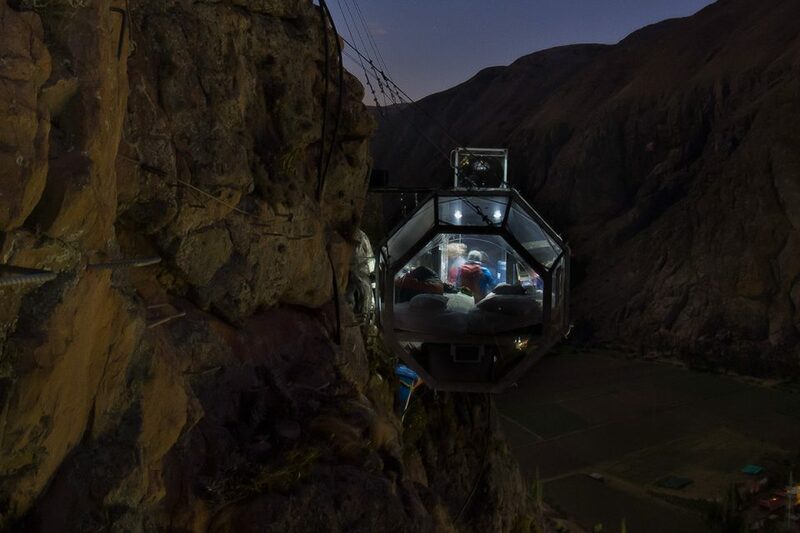 The Skylodge Adventure Suites just might be the world’s “edgiest” hotel as you literally sleep hanging off a twelve-hundred-foot cliff overlooking Peru’s famous Sacred Valley. It’s seriously cool, but sorry jet-set crowd, there’s no pulling up to this hotel in a taxi. 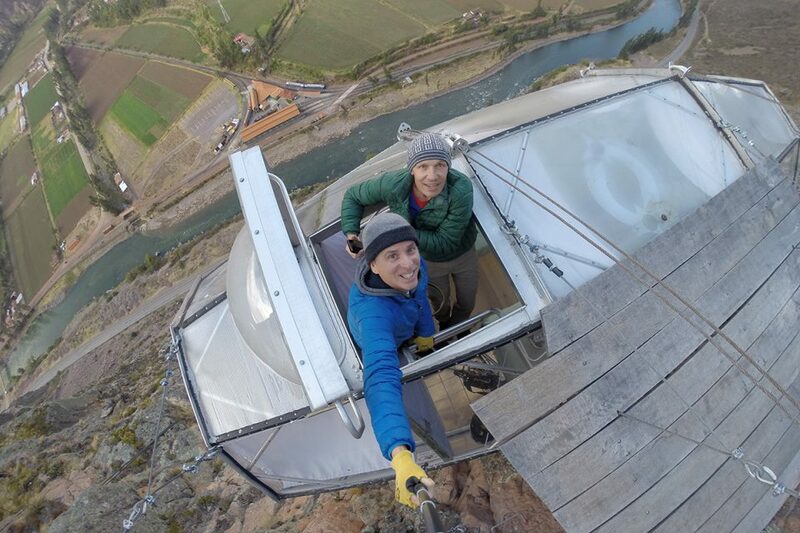 The Skylodge Adventure Suites was built by adventurers for adventurers. 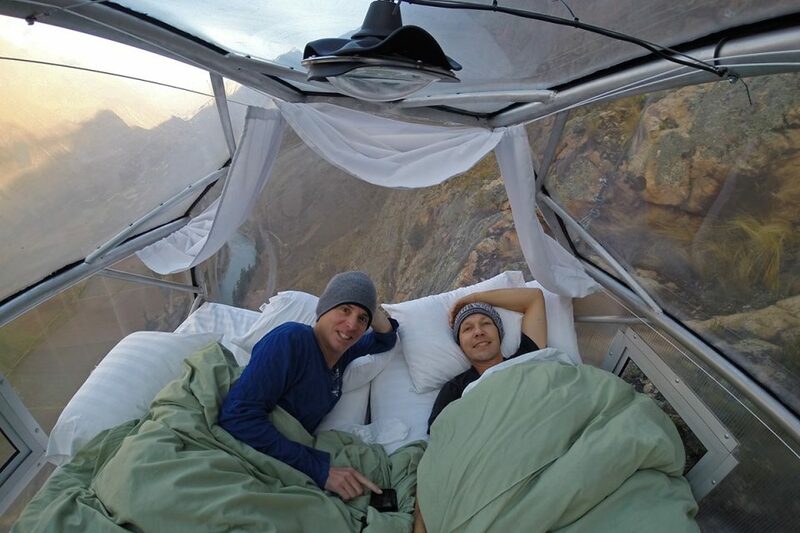 If you want to sleep suspended on a sheer Andean wall, you have to earn it. 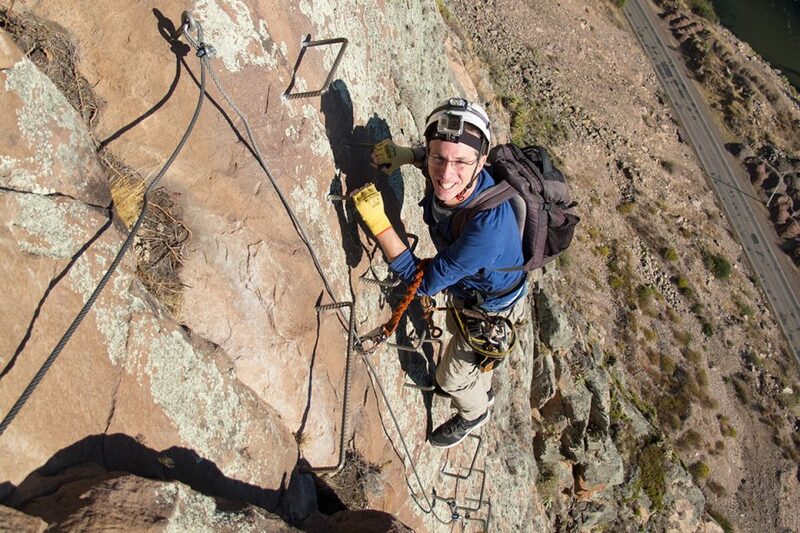 The main way to get to the Skylodge Adventure Suites is a two-hour via ferrata which winds its way straight up. For those who are new to the concept, a via ferrata is a pre-laid cabled climbing route supported with iron stepping rungs and pegs as well as cabled bridges and ladders. Via ferratas are harder than normal hiking, but they don’t really require specialized climbing skills. You just need a sense for adventure, a strong grip, and no fear of heights. I had done one via ferrata before in Catalonia, but this was Thomas’ first time (although he did just recently do the canopy climb in Tambopata National Reserve, which uses similar equipment). Starting was a cinch: we got harnessed up, listened to a quick introduction from our guides Micher and Guillermo, and off we went up the cliffs toward the Skylodge Adventure Suites. 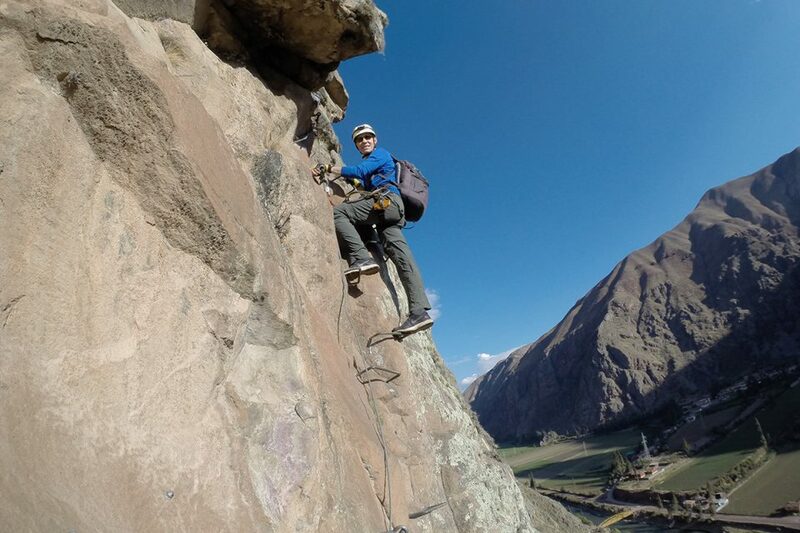 The climb was exhilarating with views out over the Urubamba River as well as the surrounding mountains. Natura Vive’s via ferrata route was actually the perfect level of difficulty: not too hard for newbies, not so easy that it would bore experienced climbers. Indeed, it was quite a thrill as we moved up sheer rock faces, inched along narrow ledges, and made our way over a tightrope-like cable bridge. Along the route, we stepped across 1,400 iron stepping rungs and passed around 400 cable attachment points. As you can see in the video, those cable attachment points were a big part of the trip: each time we got to one, we had to de-couple and then re-couple the carabiners that secured our safety lanyards to the cable. The via ferrata was a total blast! But as crazy as it might sound, the accommodation felt like an even bigger adventure. 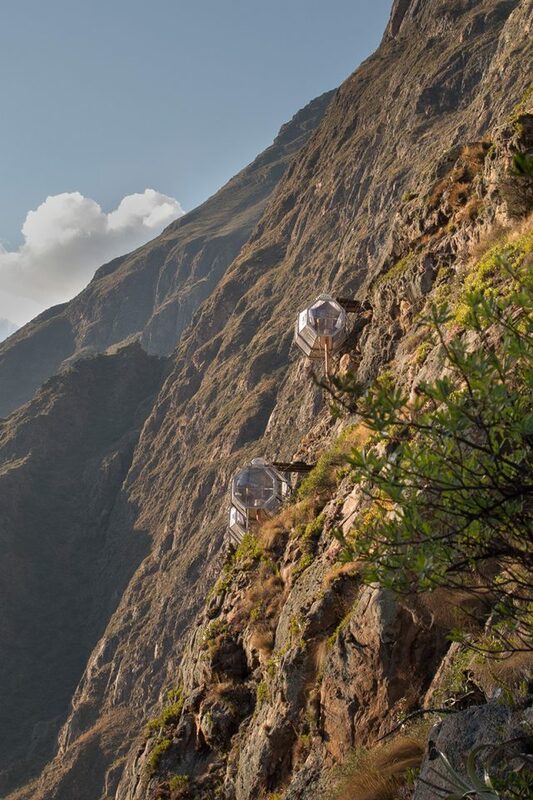 Clinging to the cliffs a thousand feet above the valley floor, the Skylodge Adventure Suites are actually three space-age capsules manufactured out of aluminum and polycarbonate. Approaching our capsule at sunset, we inched along the cliffs to the entry platform and descended into our suite through a submarine-like door in the roof. The ceiling and walls of the Skylodge Adventure Suites are all transparent providing what has to be the most insane hotel view on the planet. Curtains are provided to block the sun and the views of fellow guest, but we kept them open to fully enjoy this once-in-a-lifetime view. The bathrooms are also very intelligently designed to maximize views and minimize embarrassment. There’s a small sink and a very cleverly designed dry toilet unlike anything I’ve seen before. Honestly, it’s almost worth the entire trip just to experience the bathrooms. Of course, water has to be carried up the mountain and waste has to be carried down, so visitors have to be realistic about the limits of living on a cliff. Having said that, I was stunned by the level of luxury Natura Vive has achieved. That luxury extended into their amazing dining experience. 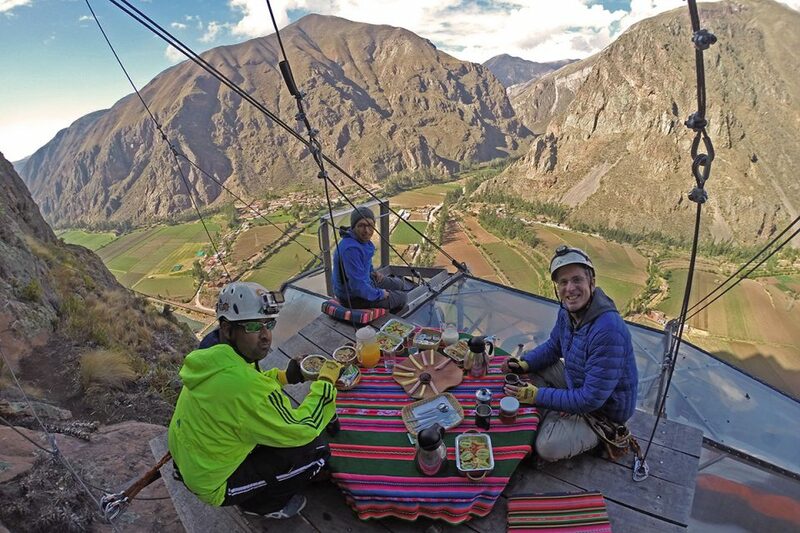 Food is prepared in Urubamba and carried up during the via ferrata. We watched through our walls as Micher climbed from his capsule to ours through strong winds loaded down with a backpack full of food. After he descended into our suite and started unloading our dinner, we actually started laughing. To start, Micher pulled out two wine glasses and served us a glass of red each as well as a separate glass of freshly made passion fruit juice. Amazingly, each course was actually served in a ceramic serving dish with a tin liner to minimize washing. (How do the glasses and ceramic serving dishes survive all that climbing?) The food was equally impressive. We began with pumpkin soup with fresh cilantro and croutons followed by a full dinner salad topped with apple slices, sunflower seeds and honey mustard dressing. The main course was delicious grilled chicken with a fantastic quinoa side dish. And the biggest surprise, the dessert was a brownie topped with a passion fruit glaze and fresh strawberries. Micher actually apologized because the dessert had slightly shifted to the side of the dish during the climb up from the Sacred Valley. To us, it was nothing short of a miracle that he had managed to climb a thousand feet up to the Skylodge Adventure Suites with all this food on his back and the only issue was a slightly off-center dessert. Insanity! This is one meal I will remember forever. 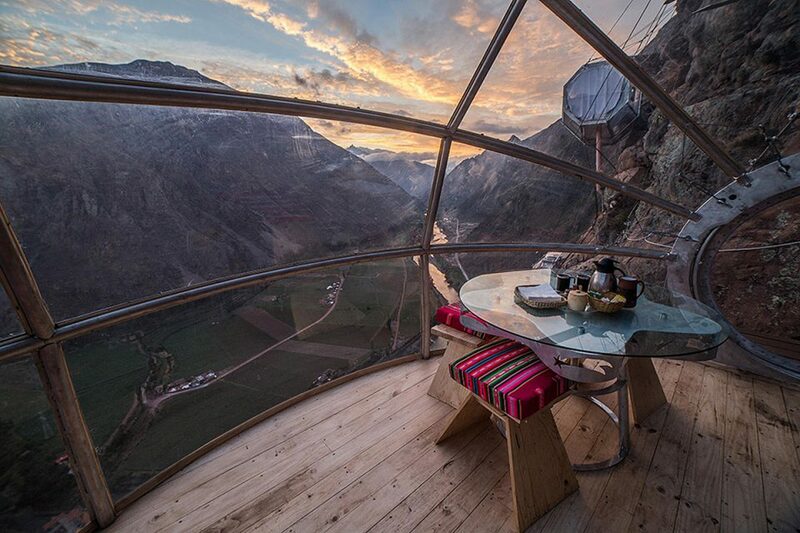 Since we did our Skylodge adventure in 2014, Natura Vive has added a large dining capsule with an equally fantastic view over the Sacred Valley. It’s a great addition to the Skylodge Adventure Suites. And what better place for guests to share a meal and discuss their views (pun intended) than 400 meters above the ground. After one of our greatest nights ever, we woke to discover one of our greatest breakfast experiences ever. Clear skies and no winds meant that a group breakfast was served on the entry platform of the guides’ capsule. We sat on the exposed wooden platform (secured to the safety cables) feasting on fruit salad, muesli, yogurt, a ham and cheese platter, eggs made to order, fresh squeezed orange juice, coffee, tea… and the ultimate 360 panorama. Breakfast also gave us a chance to really get to know fellow guest Kesav, a lawyer/entrepreneur who spent his spare time traveling the globe seeking out the world’s most extreme experiences. Wing walking, alligator wrestling, bungee slingshots, cheetah racing, great white shark diving… he had done almost everything. 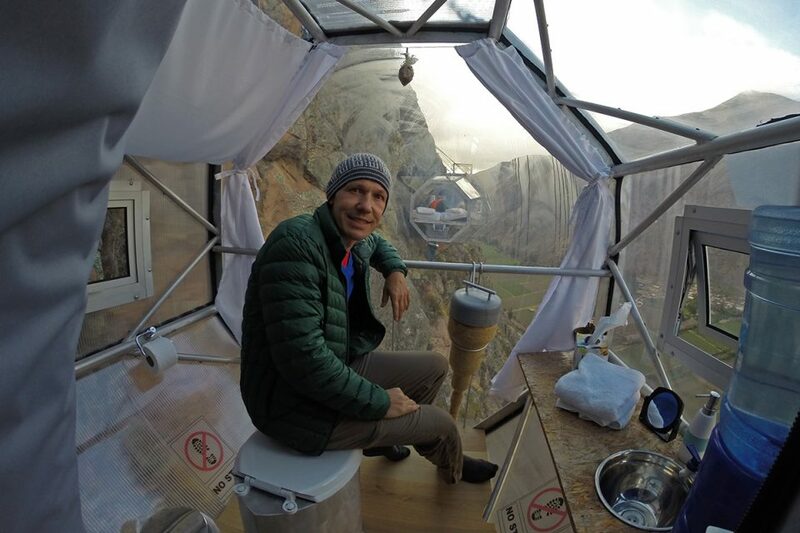 And now Kesav had experienced the Skylodge Adventure Suites, the world’s edgiest hotel. The first line was fast and furious… and a bit intimidating to us relative newbies. It’s quite a rush flying through the air with rocky outcroppings zooming by. But everyone did quite well, so we advanced to zip #2. 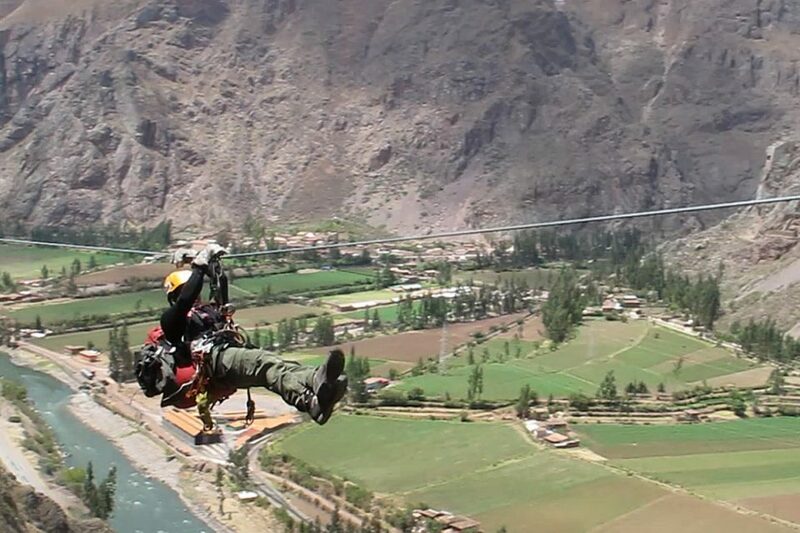 The second zipline was a bit of a shock, a 500 m (1,640 ft) stage that took visitors soaring way out over the cliffs. The ride felt REALLY fast to me, but Thomas calculated we topped out at about 45 kph (28 mph). If you’ve ever dreamt of playing Andean condor for a day, this is the trip for you. Achieving speed was not a problem on zip #4. The line was so steep and fast that they had to use a special breaking mechanism at the end to slow us down. Let’s just say that line really makes an impact. 😉 There was also something especially beautiful about zip #4 to me; I think it was the way you glided just above the rocks and slopes. The last stage of the zipline is really more of a rappelling-zip hybrid, so you get to throw an extra sport in for free. Visitors rappel a few meters down a cliff and then are manually lowered along a steep zipline to the ground while they watch the Skylodge Adventure Suites disappear in the distance. It was an odd feeling which required a certain leap of faith, something which was a bit hard for a control freak like me. Luckily, Micher and Guillermo had everything under control; they were exceptionally professional guides who communicated well with us and provided the perfect amount of motivation and support. I think it goes without saying that professionalism and safety are vital with such adventure sports. We have to say that we were exceptionally impressed with every aspect of our Natura Vive experience from the well designed via ferrata route to the elaborate construction of the Skylodge Adventure Suites to the safety-conscious ziplining experience. The fantastic dinner, the luxurious bedding, and the thoughtful construction of the bathrooms speak volumes about their dedication to quality and the environment. We also had the opportunity to meet Natalia, one of the owners of Natura Vive. 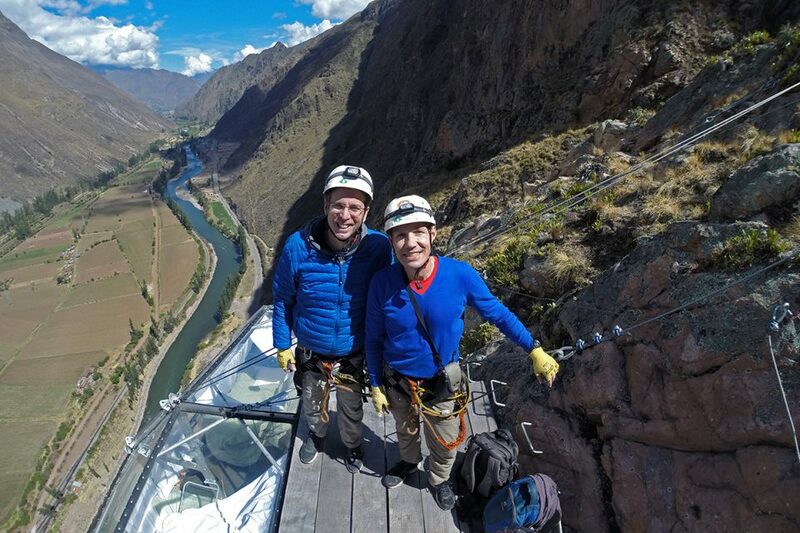 She told us that her children Llana and Silvestre had actually done the via ferrata to the Skylodge Adventure Suites when they were three and a half and four years old. I think that fact says a lot about their faith in their construction and safety standards. Natura Vive offers a variety of packages. You can choose a via ferrata trip, a ziplining experience, or combine the two sports and stay in the Skylodge Adventure Suites. 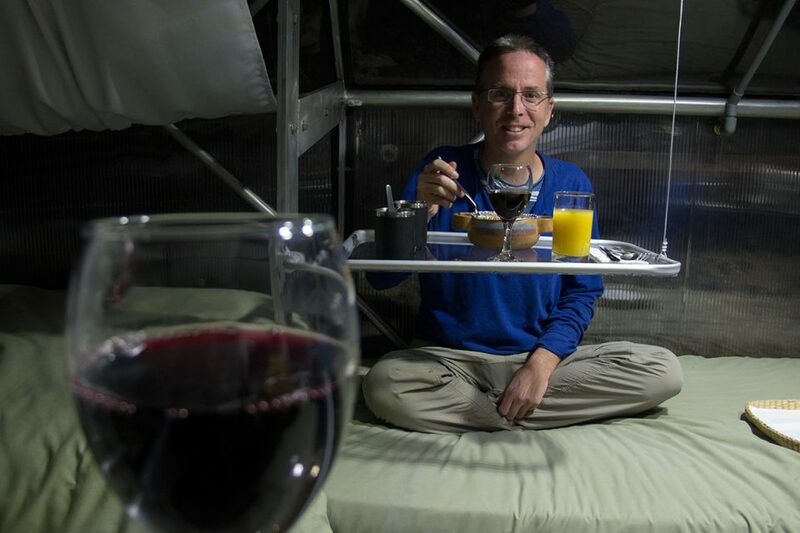 Alternatively, you can just visit the Skylodge Adventure Suites’ dining capsule for a four-course lunch. You will probably never work as hard for a meal, but the rewards are phenomenal. At present, there are three capsule suites for visitors each holding up to four guests. The trip is also suitable for adventurous families, but it is important to understand the climbing and heights involved. Natura Vive suggests a minimum age of 7, but they are flexible and understand all people have different skills. Our tip: Do the whole overnight package – it’s AWESOME! When to Go – The best time to visit Peru’s Sacred Valley is June to August during winter in the Southern Hemisphere. Days during the peak season tend to be dry, sunny, and clear. If you prefer fewer crowds and lower prices you should definitely visit during the shoulder seasons, April to May and October to November. 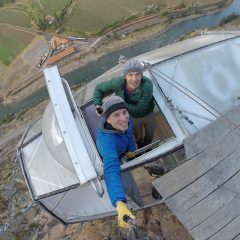 We visited the Skylodge Adventure Suites in October and, as you can see in the photos and video, had very pleasant weather. Accommodation – The Skylodge hotel is getting increasingly popular so we highly recommend booking the Skylodge Adventure Suites in advance, especially during high season which runs from May to September. To find out more about the Skylodge Adventure Suites price and booking options, you can either contact Natura Vive through their contact form or book directly on Viator, which frequently offers special discounts. 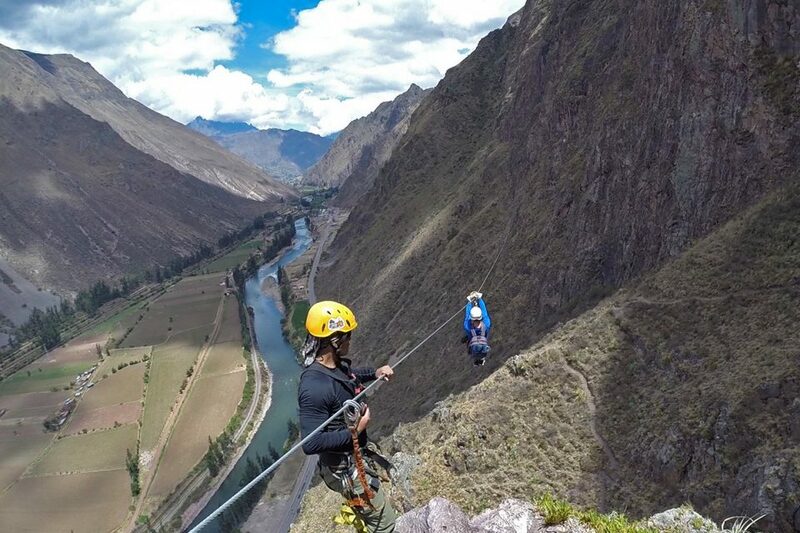 After your one-night stay at the Skylodge Adventure Suites, we recommend sticking around a little longer to explore the gorgeous Sacred Valley, one of Peru’s top highlights. Visitors can stay at either end of the Sacred Valley, in lively Cusco (also spelled Cuzco) or in quieter Ollantaytambo. Both towns have plenty of accommodation options. To find great deals, check out Hotelscombined.com, a site which offers the best deals across numerous top hotel booking sites, including booking.com and agoda. Guidebooks – We usually travel with a Lonely Planet. During our six months in Peru, we used the Lonely Planet Peru guidebook and really liked it. It’s great for cultural and historical info, maps, hiking tours, itineraries, and includes highlights such as Lake Titicaca, Colca Canyon, the Peruvian Amazon, the Salkantay trek, Apu Ausangate, Machu Picchu, and many others. For a more visual guidebook, we recommend the DK Eyewitness Travel Guide: Peru . All guidebooks can be conveniently purchased on Amazon. Travel Gear – One piece of equipment we highly recommend for the Skylodge Adventure Suites is an action camera such as the GoPro to capture everything on film. Since you will be climbing and holding on to rungs and cables, a GoPro head strap is absolutely necessary. Looking back at our video, we think this was money well spent. Disclosure: For the Skylodge Adventure Suites experience, we were guests of Natura Vive. However, all of the opinions expressed here are our own. In addition, the article contains links that help us earn a small commission at no extra cost to you. Thank you for your support! Edgy is one word for it. Terrifying is another. Not terrifying, thrilling!!! The best way to overcome your fear of heights is to do a couple via ferratas. Wow, das ist ja geil. Muss man da Vorkenntnisse haben? es sind keinerlei Vorkenntnisse erforderlich. Ein Ansatz von Sportlichkeit und Schwindelfreiheit sollte allerdings gegeben sein (und natuerlich der Hang zum Abenteuer). Do you have to have classes or some kind of certificate to do the climbing? Hey Seth, That’s actually the same question Michaela asked above in German. No, you don’t need any special training, just a sense of adventure. They show you how to use the equipment before you go up. Holy crap this is awesome! And the pic of you two in the pod is super cute :). Wow!!! I’m impressed that it exists. And I’m impressed that you did it. Glad you did this. Allows us less bold to share in your adventure. I was in Peru in 2014 went to Machu Picchu. And took few trips here and there while in Aguascalientes Calientes. Our driver stopped in the middle of the road just to point us to see that hotel rooms (sky lodge) where you guys have the best views of the sacred valley and the urubamba River. Man we though that what kind of crazy people would stay in those rooms? How they would get there? And many other questions. Well I’m watching your video guys climbing to get there and having so much fun, so I would say kudos to you guys. That I think is something that I probably would never do, but I really admire you guys for that sense of adventure. I would like to share your experience with Trip Advisor whom is listing the coolest hotels around the world. But unfortunately nobody has posted anything about this place. I would love to be the first one to share it with them and the world readers on Trip Advisor. I don’t see a shower… How do you get clean? I am travelling by myself in Peru next year. Is the package suitable for solo travellers? The Skylodge is absolutely suitable for a solo traveler. Very likely, you won’t be alone. The Skylodge has been in the media so much that we would advise you to book way ahead. It’s so much fun! If I did it, you could! I’m going to Peru next month so will definitely check it out! I really like the concept, but i am deadly afraid of heights. My thoughts exactly – at first. But when I realized you are connected to a safety wire the whole time, I had a lot more trust, and it went quite smoothly. It’s definitely a worthwhile challenge! Yeah, it’s like an overnight version of our via ferrata in Catalonia. You would love it. Alejandro Barrios Olano Felipe Barrios another excuse to go to cusco?? Loved our trip and would do it again and again. Kirsty Nichols, let’s do this! Go for it, it’s so much fun! Shedia Marzouk Will love to do that!! Hahah lets do it together!! cosinhaa no lo haria con otra persona en el mundo! Can you comment on the safety on the pod please? How is it built into the face of the mountain? Thank you! From a guest’s point of view, the capsules felt incredibly safe. At first, we were wondering about the safety as well, but quickly realized we didn’t have to worry. The day we slept in the capsule, it was windy outside, but inside you couldn’t feel any movements, not even a vibration. The capsules are well-anchored in the rockface and are quite an impressive engineering feat. I would love to do this, but I’m not a fan of zip lining. I’ve seen you have the option to NOT zip line down? Do you then just take the same route down that you did to get up? You don’t use the via ferrata route to climb down again, but there are two other options: one is a hiking/ziplining combo, and the other is a hiking/rappelling combo. We chose the ziplining combo and had a lot of fun, also it felt quite safe. The guides were also fantastic, instructing us properly and making sure we felt comfortable the whole way down. Hola quiero reservar el zip line para 2 personas el día 7 de Abril. Estaremos hospedadas en el Ramada Cuzco. Quizás adicione más personas al grupo. Comuníquese directamente con la compañía para reservar el zip line en Natura Vive. Hi there, this is one of my bucketlist. I was just wondering if there’s a way i could use a drone so I could get photos of the capsule while I am lying on my bed? I know people have used drones in the past, but I have no idea whether or not drones are still legal in 2018 in the valley. A lot of places are banning drones or requiring drone permits. Book a Night in the Adventure Suites! The cozy Apu Lodge, located in quiet Ollantaytambo, features a beautiful garden and lots of local charm. Check out all the inns and lodges in this quiet and attractive community.